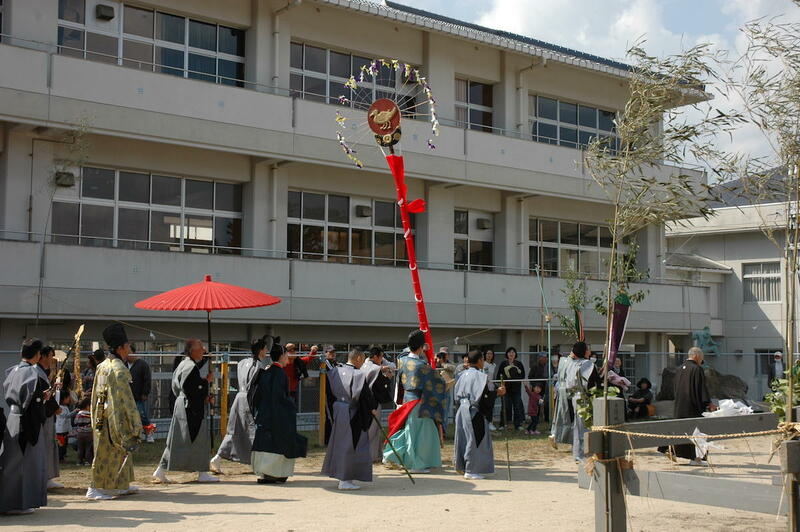 During this festival, Yama-hiki-shinji, a ritual to pray for good health, is carried out. During this ritual, a giant float decorated with a crane and a tortoise (symbols of longevity) and which resembles the mythical Chinese mountain of eternal youth, Mt. Penglai, is pushed around the shrine grounds by boys up to the age of 7 from the area. 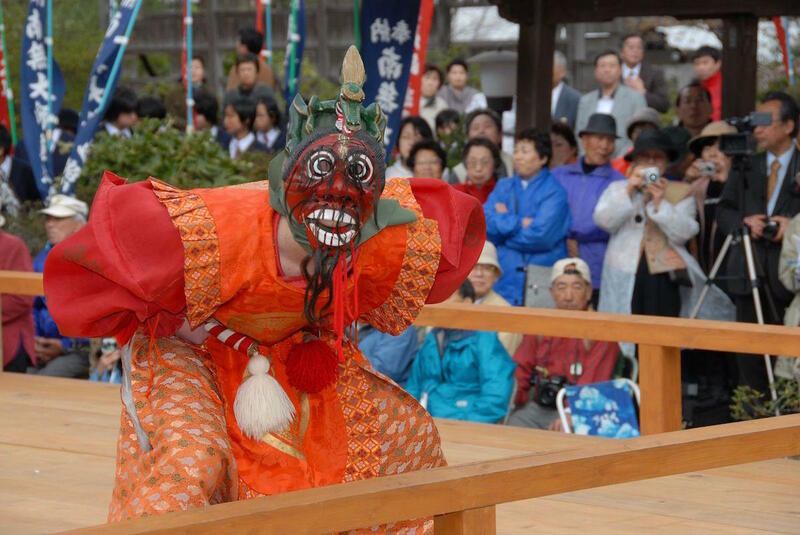 Kagura (Shinto Dances), Shishi-mai (Lion Dance) and Yabusame (Horse-back Archery) each of which have an old-fashioned style, also take place. 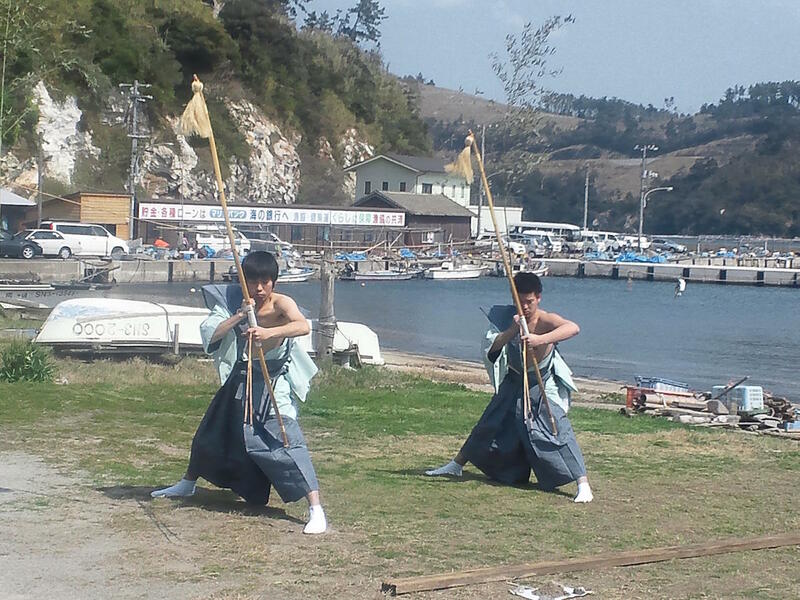 Perhaps the most well-known festival in Dōgo Island, during which the impressive Uma-ire-shinji ritual takes place. 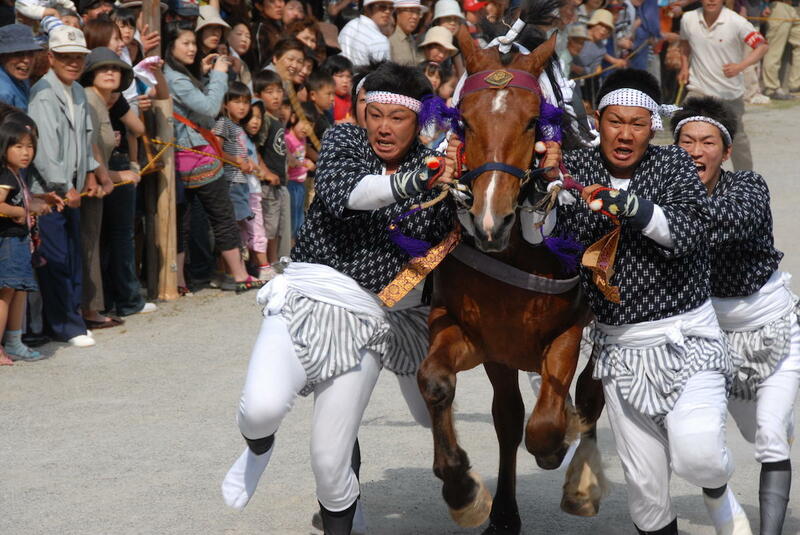 During this ritual, horses carrying gods from different areas around the island run through the shrine grounds. Today, the shrine ritual takes place to pray for a good harvest. 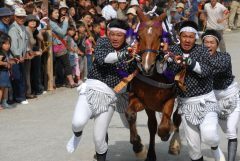 Other rituals include a rice-planting ritual, and horseback archery. 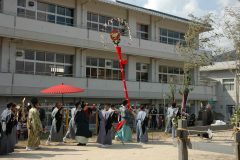 The mikoshi (portable shrines) of the Sun God (represented by a Three-legged Crow) and the Moon God (represented by a White Rabbit) are carried from their shrines to the festival grounds in a procession lead by 4 meter-long poles bearing their symbols. They circle the festival grounds to symbolize the rotation of the cosmic forces. 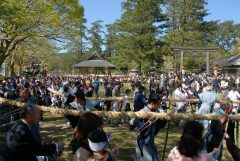 Kami-sumo dance, Miko-mai dance, horseback racing and horseback archery also take place. Oki Ushitsuki (Bull Sumo) is a cultural tradition of the Oki Islands thought to date back 800 years, making it the oldest traditional Bull Sumo in Japan. It is said to have commenced in order to entertain Emperor Gotoba, who was exiled to Nakanoshima Island in 1221 after the Jokyu Rebellion. The Emperor is said to have been pleased by the sight of two small cows fighting in a field. 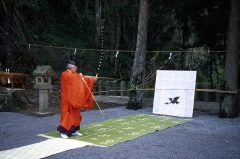 The tradition later spread to Dōgo Island, where it is still practiced today. 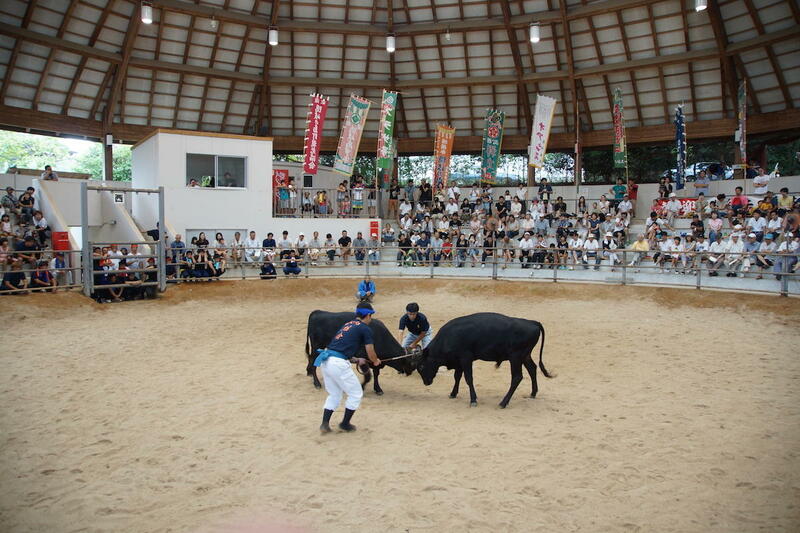 There are two kinds of Bull Sumo events, hon-basho which are serious tournaments wherein only the bulls in the higher divisions fight to the end of the match (ie: when one bull turns away from the fight). A losing bull does not fight a tournament match ever again. On the other hand, kanko-ushitsuki are displays for organised for tourists. 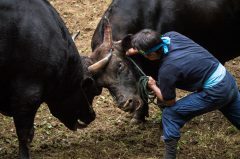 The bulls do not fight a full match. 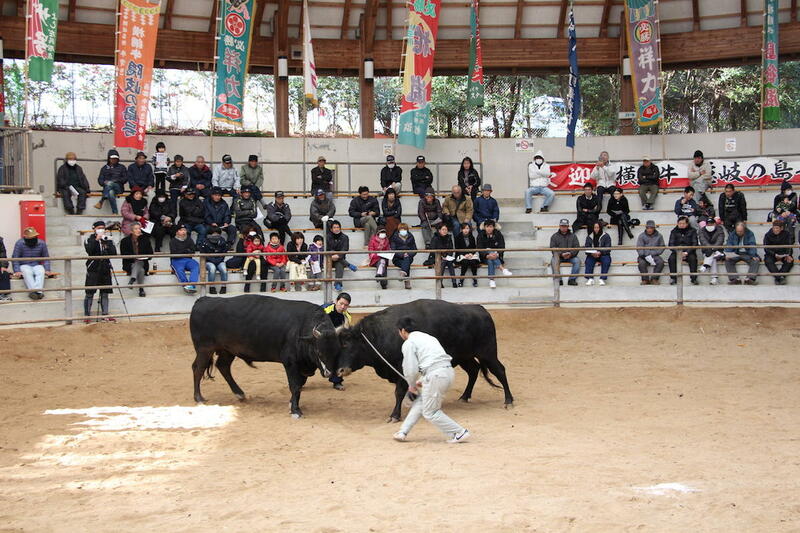 A unique feature of Oki Bull Sumo is that the bulls’ keeper remains in the ring with their bull for the entire match. Hon-basho Tournament. 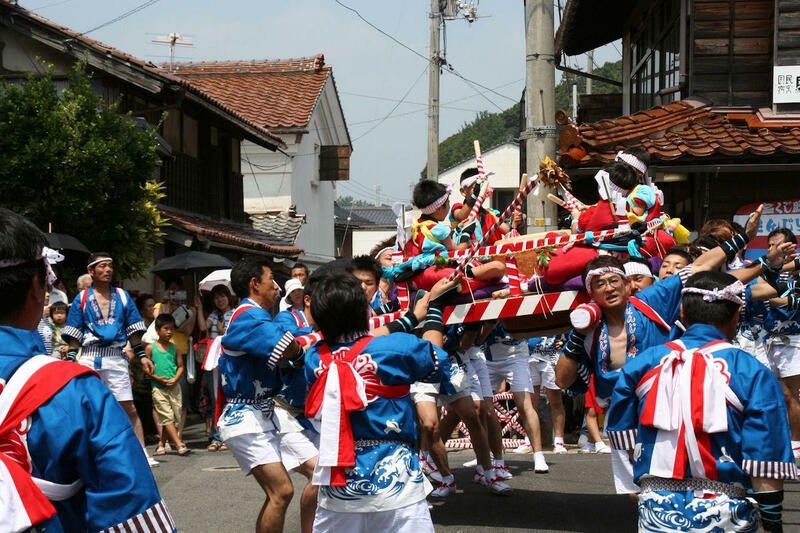 This event takes place as a ritual offering of the Dangyō Shrine & Hassaku Shrine Festival. It is the oldest of all the tournaments in Dōgo Island. 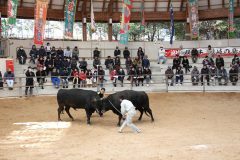 In the days before the tournament, the bull owners go to drink from the water of the Dangyō Shrine, which is known as “winning water”. They also give this water to their bulls to drink. Hon-basho Tournament. 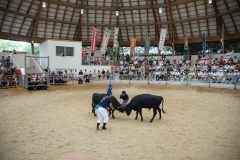 One of the largest Bull Sumo Tournaments alongside the Hassaku Tournament. It takes place as a ritual offering of the Ichiyagadake Shrine. 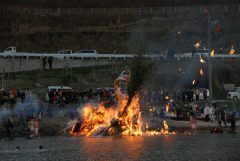 This unique festival takes place in order to burn the New Year’s decorations and to entrust one’s health up the holy flames. 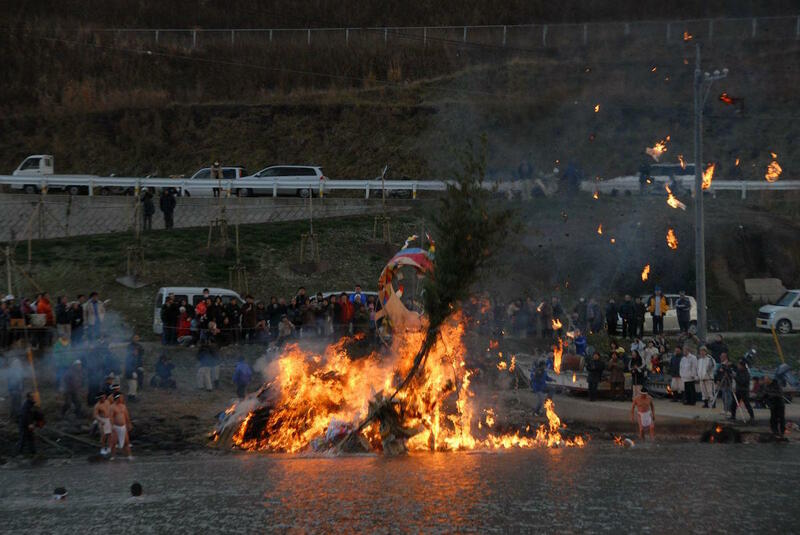 During the festival, four sacred bamboo stalks are piled with decorations and placed along the coast to be burned. When the burning bamboo stalks topple into the sea, local men jump into the cold water and scramble to retrieve them for good luck. 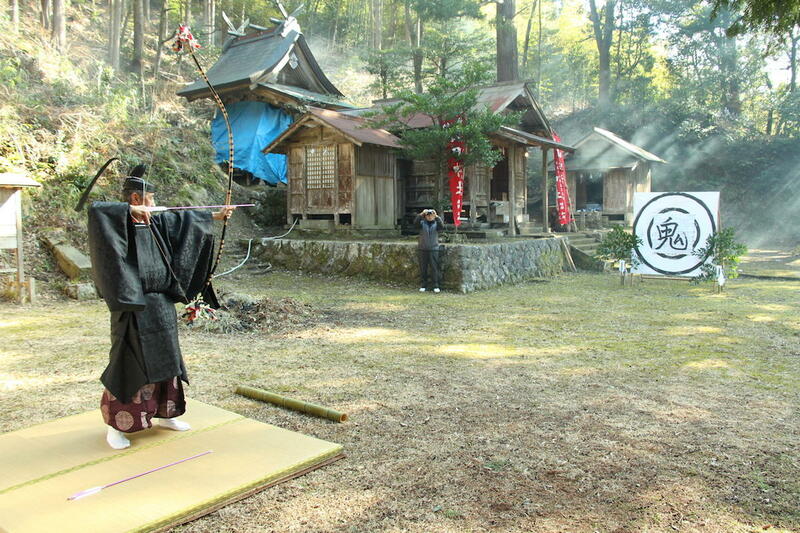 During this festival, archers shoot arrows at targets with pictures of a crow and a mouse. This was formerly a prayer for the spring harvest and a thanksgiving festival for the autumn, however today it only takes place once a year. Millet is one of the offerings given at this festival. 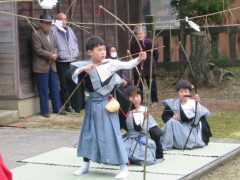 Three boys (1st grade elementary school students) of the shrine area are chosen to drive off evil spirits from the area by shooting arrows. During this ancient festival, archers shoot arrows at targets with pictures of a crow and a mouse to pray for a good harvest. Two boys chosen from the village shoot arrows to expel evil spirits from the area. On the day before the festival, participants go into the forest to cut down a long vine, and walk with a 4m long sacred sakaki branch to purify the village. 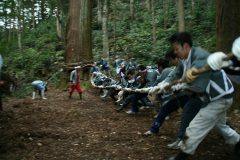 On the next day, they begin purification ceremonies at Kasuga Shrine, and then walk with the vine to a sacred tree shrine in the forest. There they wrap the vine around the tree seven and a half times. 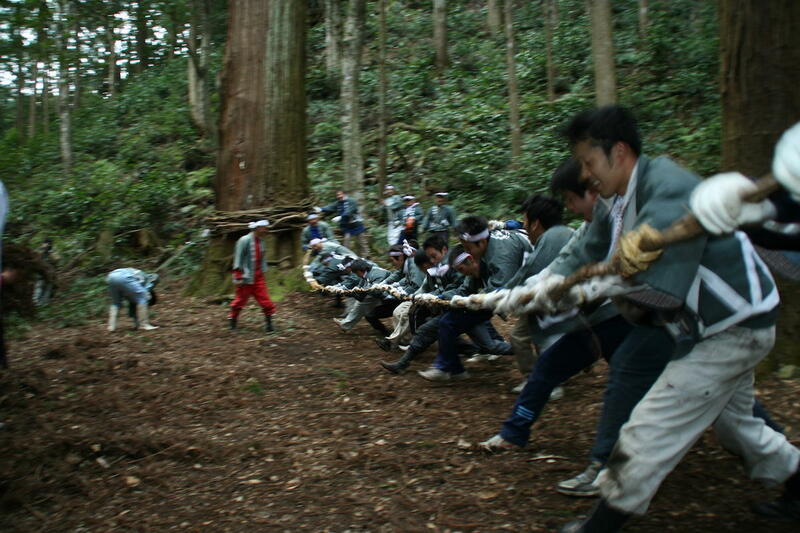 This festival takes place at the beginning of Spring, to pray for safe work in the forest throughout the season. 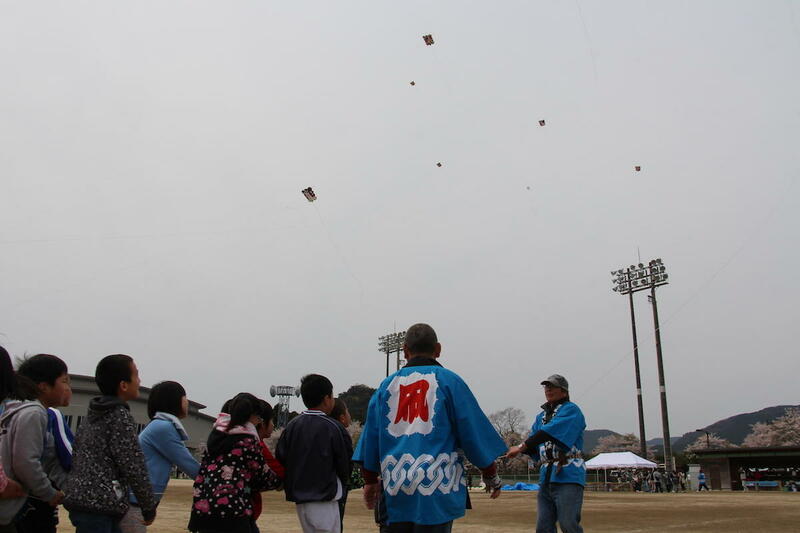 Names of the children born in the previous year are written on these traditional kites and flown to pray for their health and prosperity. 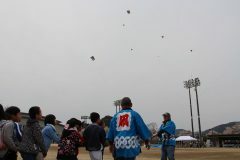 The kites have a unique design, with 10 rounded “ears”. When the kites fly, they make a loud booming noise in the wind. These Buddhist dances preserve the style of ancient court dances performed in the Nara Period (710 – 794). There are seven dances which are performed on an elevated wooden stage. The masks worn by the dancers are believed to have South East Asian roots. The event takes place on the anniversary of the death of Kobo-Daishi, a famous Japanese monk. This garden located within the grounds of Murakami-ke Residence features 10,000 Oki Rhododendron flowers. When in bloom the whole hillside turns pink. 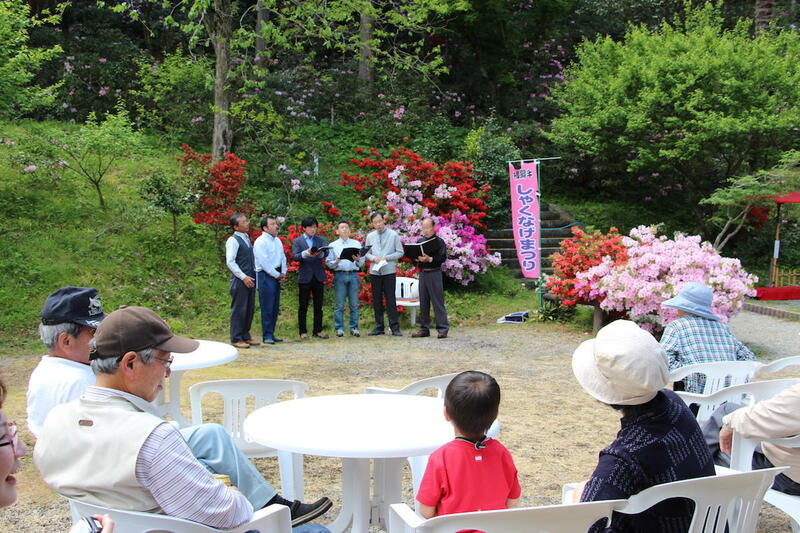 During the flower festival, there is an open-air tea ceremony, stalls, and folk song performances. 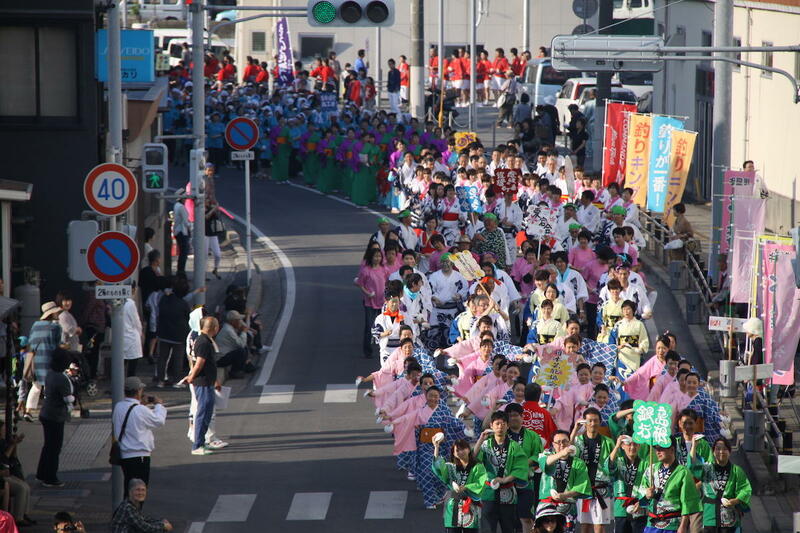 Signifying the beginning of the tourist season, this parade takes place along the main street by the Saigō Port. 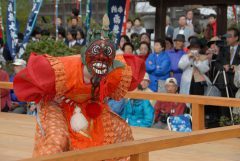 It features around 1,500 participants who dance to the Shigesa-bushi, one of the most iconic folk songs of the Oki Islands. The dance is performed with two small plates or other objects. The Oki Shigesa-bushi National Convention takes place the following day of the Shigesa-odori Parade. 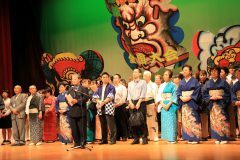 Singers and folk song fans gather from all over Japan to celebrate and preserve the Shigesa-bushi folk song. Every year, over 100 folk singers attend and compete for the title of best shamisen player or singer. This intense Ultra Marathon features a full 100km marathon course around the perimeter of Dōgo Island, as well as a 50km half marathon. 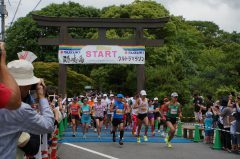 Runners can enjoy the beautiful nature of the island and the enthusiastic support of the volunteers and local people who come out in large numbers to support them throughout the marathon. Four young boys hop aboard a decorative portable shrine called a “Danjiri”, and play the Taiko drum while the men carrying the shrine sing. The way they move the shrine is like a dance in itself, and a unique feature of this festival. 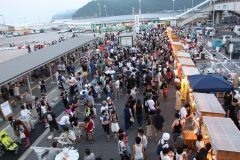 During this festival, groups from different areas around the island open stalls and perform on stage. 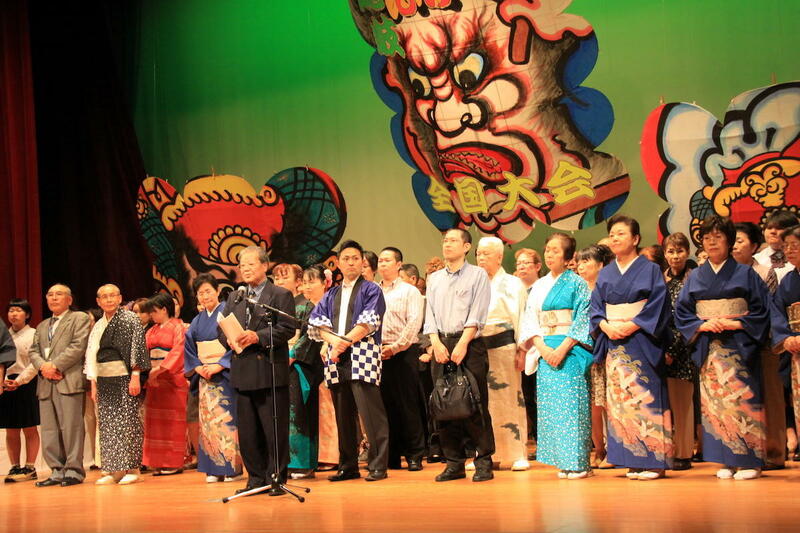 Performances include folk songs, taiko, and more. 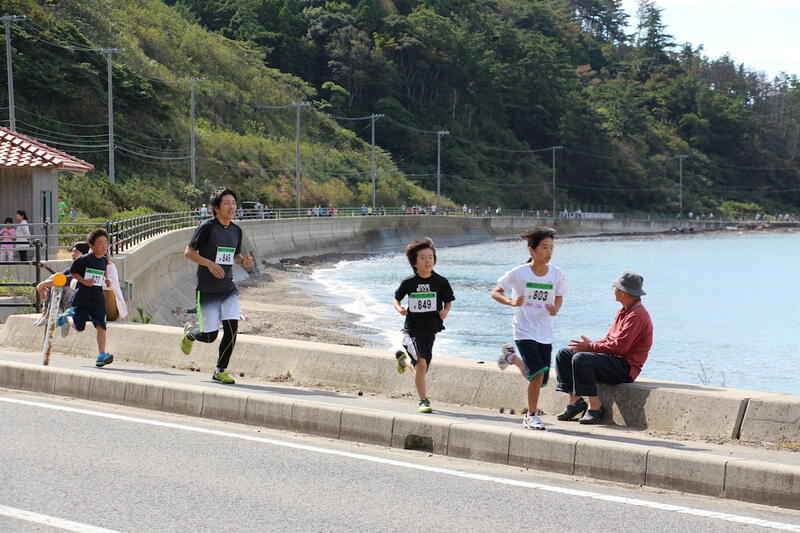 This fun local marathon takes place around the west coast of the island.